A Prince Edward County councillor has been reprimanded for using vulgar and loutish language in an email message that was erroneously sent to council, staff and a resident in late October. Council voted to reprimanded Sophiasburgh’s Bill Roberts after accepting a report from integrity commissioner Robert Swayze Tuesday evening. It directed Swayze to investigate Roberts for sending a vulgar and abusive e-mail Oct. 30 and, through his determinations, the Kitchener-based solicitor found the missive was contrary to council’s code of conduct. The acceptance of the motion at Tuesday’s open meeting serves as the public reprimand. Swayze, who serves as integrity commissioner for as many as 25 municipalities in Ontario, stopped short of recommending any further punishment including suspension of salary. The review process started when council received the request from a resident to explore a code of conduct complaint against Roberts after receiving the e-mail on Oct. 19, 2018. On the next day, according to the report, Roberts sent an apology for sending the email to the same recipients. “I find that it is contrary to section six of the code. The response from Coun. Roberts was lengthy and articulate. He regrets sending the e-mail and did not purposely copy the e-mail to the large group. He intended the e-mail to go to Coun. Kevin Gale only, but pushed “reply all”,” Swayze said. “I believe his contrition expressed in the response and he apologized to the recipients immediately. Also, his response to me contained a promise never to do anything similar again. However, circulating such an email to the resident, all members of council and staff, whether on purpose or through inadvertence, cannot be excused. I have decided to recommend a reprimand but not any suspension of his salary,” Swayze added. After council received the commissioner’s report, Roberts was the only member that spoke to the motion and conveyed his thoughts. 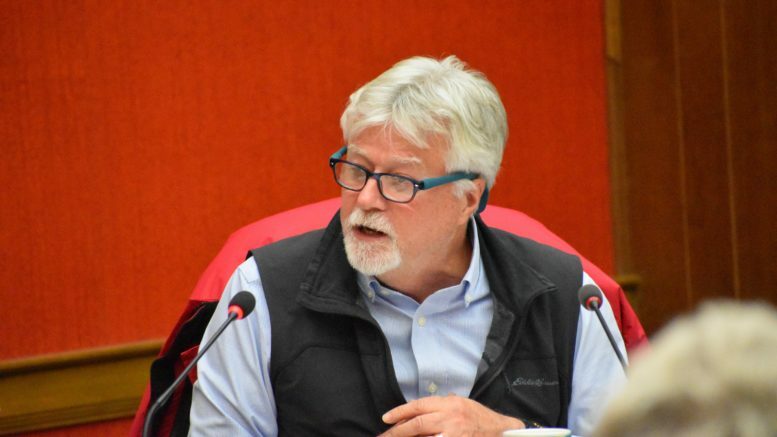 The councillor spoke of his work over the past four years in his ward and Prince Edward County including advocating for the Prince Edward County Memorial Hospital redevelopment, saving Sophiasburgh Central School and an affordable housing initiative but said this issue needed to be addressed. The councillor said he felt badly about the lapse in judgement and that councillors, even in his case where the message was sent by accident at 11 p.m. on a Friday evening, should be held to a higher standard. As Tuesday served as the last formal gathering of the current council, Roberts added the record and the memory of the meeting should not be highjacked by this item but the session should be a celebration of the many collective accomplishments by Prince Edward County government over the last four years and conveying respect and best wishes to those departing and retiring councillors around the horseshoe that night.